CAYIN Technology to launch digital signage software upgrade for its managing UI, SMP-NEO2, along with new product line including players, servers, and complementary software. SMP-NEO2 maintains the intuitive design, but it's leaner and even more efficient than its predecessor. 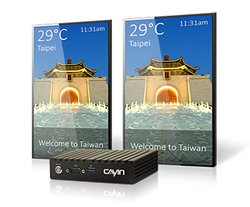 CAYIN Technology today announced the launch of its newest digital signage appliance and software in mid July. The new and improved SMP-NEO2 will come in a combo with SMP-2100, a durable and compact fanless player with high performance, while corresponding application including servers and management software rollout progressively. SMP-NEO2, the latest version of the bundled software, maintains the intuitive design from the first generation SMP-NEO. By trimming down processes that are redundant, the software is now leaner and lighter. This gives the designed hardware a much better performance that is not only stable, but faster in response to commands. With the added feature of online registration, SMP-NEO2 also provides an anti-theft environment to protect data and the software itself from being bootlegged. Alongside SMP-NEO2, comes SMP-2100, a solid metal build player perfect for a range of applications. The SMP-2100 comes with 2 HDMI outputs to ensure output quality, whereas the solid-state drive makes it a suitable choice for it to withstand rough handling. SMP-2100 will be the first model to adapt to the SMP-NEO2 software, which will be implemented to all future SMP-NEO models, including the 4K UHD model that is currently under development. To accommodate the new SMP-NEO2, content management server (CMS) Version 10 will also be released later in July, as its dedicated management enhancement software, SuperMonitor5, becomes available. The server software shares many characteristics as SMP-NEO2, including leaner processing, better performance, and a more secured environment. Though CMS V.9.0 supports SMP-NEO2, to receive full-function access when managing and grouping SMP-NEO2 players, users are encouraged to select CMS V.10.0.